There are myriad opportunities for drug interactions involving antimicrobial agents. 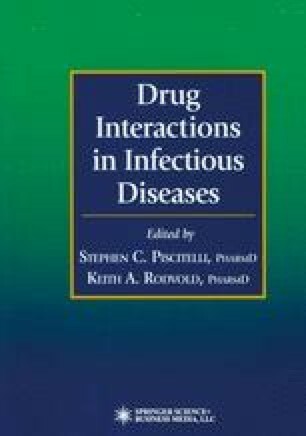 The potential for drug interactions encountered in clinical practice continues to grow as the number of different antimicrobial classes expands, the number of specific agents within these drug classes increases, and antimicrobial drug regimens become more complex (e.g., treatment of mycobacterial infection and human immunodeficiency virus [HIV] disease). In addition, antimicrobials are commonly used in certain patient populations (e.g., critically ill, geriatric, and HIV-infected patients) where many drugs of various classes are being used and the potential for drug interactions therefore increases as a function of the number and types of drugs present. Many interactions are of minimal clinical importance and often ignored. However, other interactions are associated with substantial risk of adverse pharmacokinetic or pharmacodynamic interactions, resulting in decreased therapeutic efficacy, increased incidence of drug toxicities, and potential for increased antimicrobial resistance. Thus the ability to prevent or minimize adverse drug interactions is of vital importance in optimizing the appropriate and effective use of antimicrobials and enhancing patient outcome.